The first community picnic of the semester. A sunny Saturday at the end of September with just enough breeze and shade to make it perfect. Although the picnic began at three, final preparations took place the night before at the cooking party, a small gathering open to anyone in Hope Gardens willing and able to help. This particular cooking party was led exclusively by the Outreach Committee, who may not be the Nutrition Committee, but can definitely still hold their own in the kitchen. The only difficulty came with figuring out how to use fresh ingredients in recipes that called for canned goods. This problem, we realized, is one that people dealing with food insecurity often face in their efforts to eat healthier. It's a shame that even when fresh food is available, it's often difficult to know what to do with it; this is why programs like our own Hope Cooks are so important, they give people the context necessary to pursue healthier options. Using trial and error, we were able to figure out what worked and we started making green bean casserole and fig bars while listening to all the oldies music you'd expect a bunch of garden hippies to be listening to. It was a great way to end a long day of classes and practice our culinary skills in the process. 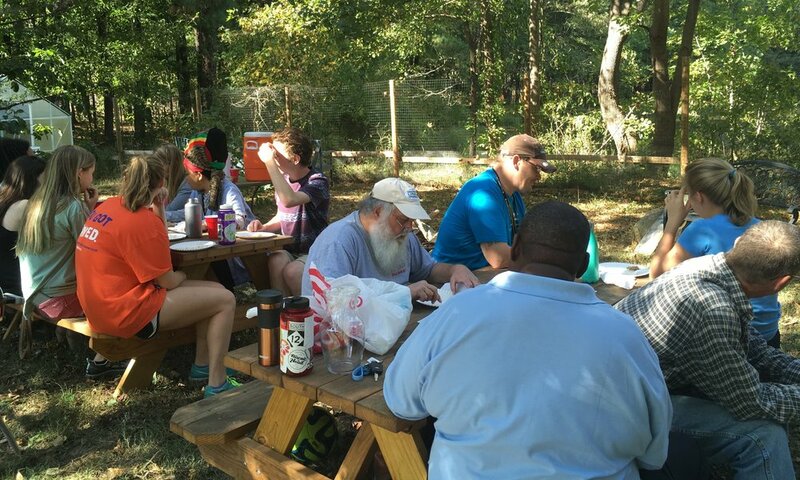 The picnic itself got off to somewhat of a rocky start when we learned that CEF, an organization that aims to address homelessness and poverty locally, was hosting another picnic that same day. A few people got back in time for pick-up so we ended up with a good-sized group of community gardeners, members of Hope Gardens, and people from CEF and IFC. It was an eccentric group to say the least. We never actually got the real name of one man, he simply went by Santa due to his long, white beard. Another man brought his adorable dog named Gizmo who's pictured to the right. A community gardener also played us Rihanna's entire discography and implied her superiority to Beyoncé (I'll resist the urge to launch into an entire paragraph debating that claim). Everyone loved the food, there were interesting conversations all around, and it couldn't have been a more relaxing way to spend the afternoon. Once everyone was finished eating, we brought out bricks to be painted for herb boxes that were going to be built during the next few garden workdays. Some of us finger-painted, others used brushes, and we all had a great time expressing ourselves artistically (even though some of them looked like they were done by toddlers a.k.a. just mine in the bottom right corner). In the photo below, you can see Outreach Co-Director Haley Stone's touching tribute to her cat Buttercup and Co-Chair Kristen Wagner's impressively intricate pink flower. All in all, the picnic was a blast and we'd love to have even more people at the next one in October (which may involve pumpkins so get excited)! Also, major respect to anyone who caught that Earth, Wind & Fire reference in the title. Older PostCountdown to The Great Carolina Cookoff!